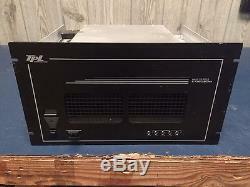 TPL 300 WATT UHF / 70cm POWER AMPLIFIER. JUST REMOVED FROM SERVICE IN PERFECT CONDITION. 5-12 watt input, 300 Watts output. CONTINUOUS DUTY - BUILT IN POWER SUPPLY. SIMPLY PLUG INTO ANY A/C OUTLET. 75 mW to 70 Watts as specified. 300 Watts VHF Low Band (29.7-50MHz), 250 or 500 Watts VHF High Band (136-174MHz), 300 Watts UHF (406-512MHz), 250 Watts (806-960MHz). FM/CW (Linear in some models). 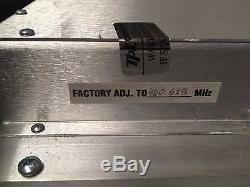 4 to 15 Amps AC, depending on model. Infinite on 800 MHz models if isolator option is selected. Overtemp, Low Power, Fan Failure, System Fault, Forward and Reflected Power, and other amplifier parameters. Front panel digital display and LED indicators. Gradul reduction of output power. 30° to +50° degrees C. 19" W x 10 1/2" H x 15 D. Three years parts and labor. 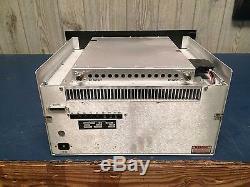 Fully enclosed compact package with switching power supply. 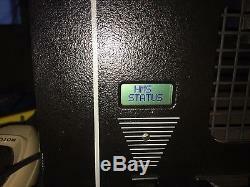 Digital meter monitoring for system evaluation and maintenance, including forward and reflected power. Adjustable output power, feedback controlled. Alarms for low power, over temperature, VSWR, and fan failure. Adjustable alarm and protection thresholds. Forced air cooling with three fans. Convenient access for amplifier adjustments. Repeater or base station operation (with coaxial antenna switch relay option). Other bands and modes available on special order. UHF 400 TO 512 MHz. PERFECT FOR USE WITH THE MOTOROLA QUANTAR OR QUANTRO REPEATERS. 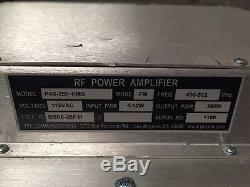 The item "TPL UHF 70cm 300 WATT 400-512MHZ RADIO BASE REPEATER POWER AMPLIFIER HAM" is in sale since Saturday, August 08, 2015. This item is in the category "Consumer Electronics\Radio Communication\Ham, Amateur Radio\Ham Radio Amplifiers". The seller is "commandcommunications" and is located in Spring, Texas. This item can be shipped worldwide.